Home /Knowledge Base /Must Read /Fix Web Browser Issues now! Home /Knowledge Base /Common Browser Issues /Fix Web Browser Issues now! Home /Knowledge Base /FAQ /Fix Web Browser Issues now! Is our app acting strange or slow? The solution is so simple that you may not believe it! You just need to clear out your browser cache by following the steps in this article. Completely shut down and restart your computer. Why? Because this frees up memory. 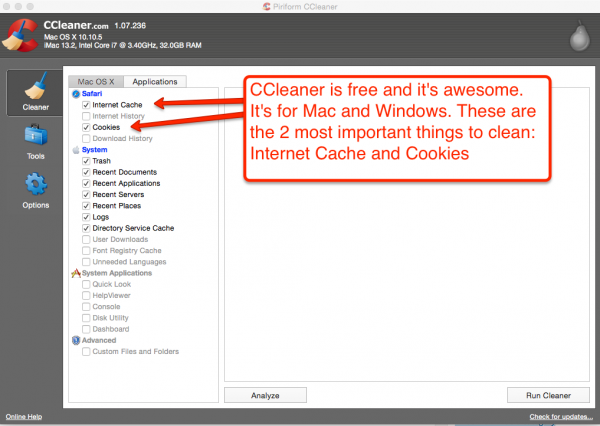 Delete temporary internet files, cache and cookies with free CCleaner. Why? Because web browsers save old versions of web pages and garbage. Our programmers make upgrades daily, so if your browser saved yesterday’s code, strange things will happen. We are not affiliated with CCLeaner. We just love it and we run it daily on our own computers daily. You should, too! It’s free, it speed things up and makes then run better! Don’t you want that? There’s a Windows version and Mac version of CCleaner (both are free). Learn more here. Did cleaning out Cache and Cookies not help solve the problem? If yes, awesome! If no, then the next step is to see if the software issue repeats in a different web browser. *To troubleshoot a problem, always download the NEWEST version of a DIFFERENT web browser: We know you love your old browser, but you won’t know if you have a browser issue until you just try with a newer version of a DIFFERENT browser. Which Browser is best? We don’t like Internet Explorer. It’s slow and terrible. 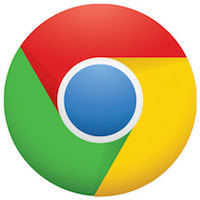 Chrome, Safari and Firefox are much faster with fewer problems. because it’s the only browser that will work for viewing the source code to import reports. but you should also have Firefox and Safari because sometimes a browser will get messed up and you need to try the same page in a different browser (just to test, to see if an issue is on your end). Are you are getting REDIRECTS to other sites or seeing ANNOYING POPUP ADS? If so, thats a different issue. Click here for help with malware. Why should we run free CCleaner? Because it’s GREAT and it’s FREE! It makes our app (and your browser) run faster and better. We love CCleaner and we run it daily on our own computers daily. There’s a Windows version and Mac version of CCleaner (get the free one).We’re not trying to sell you anything. This is just a great free tool that solves most web issues. Solving web issues means fewer support tickets, so we can spend more time building new features. That’s how everyone wins with CCleaner.Here’s why you need to remove old junk from your browser: Web browsers save a lot of garbage, including old versions of websites you’ve been to. Cleaning it out the temp internet files/garbage is required for all computers and mobile devices. 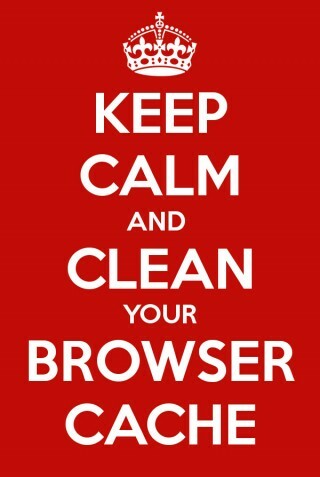 Especially if a site has changed.It only takes a few seconds to clean out and update your browser. Having an up-to-date browser version and cleaning out temporary internet files is part of life online. You’ll see similar instructions if you have trouble with your bank’s website. We all make improvements to our sites and apps, so your browser needs to stay clean or things won’t work. These are new rules of the road for any online business. Be aware that viruses and malware can also cause connectivity issues. Remove unnecessary toolbar add-ons, like coupons, weather, browser helpers, etc…these are usually malware designed to spy on you or pop up ads. Don’t view our app from within an application like AOL. User just a browser. We like Firefox and Chrome. Did you know that your IP may change every month? When this happens, your internet will be extremely sluggish. Turning off your computer and router (and having them both off at the same time for 1 minute) will solve this issue. Call your internet provider (usually your cable TV or phone company). Ask them to test your connection. First make sure you are at the correct link. www.creditrepaircloud.com is correct for Admin and Team Members. Clients and Affiliates do not login here. Make sure you are using the correct User ID and Password. These are case-sensitive and must always be typed the same (with no spaces). Use the “forgot password” link on the login page. Your login details will be sent to you instantly. Your Clients or Affiliates have trouble logging in? Help them! Most login issues are due to incorrect User IDs, passwords or links. Clients and affiliates can only log in to www.secureclientaccess.com. If you have a business online, you’ll get used to helping your clients and affiliates with login and browser issues. 99% of the time it’s operator error or a bad browser. You have their User IDs and passwords, so you can try them yourself to make sure they work. Are you or your clients seeing Annoying Redirects and Pop-up Ads? Are you seeing popup ads when you visit Credit Repair Cloud? Are you being redirected to other sites when you visit PrivacyGuard, etc? If the answer is YES to either of these questions, you have Malware. Popup ads and website redirects are not from us. We don’t do anything like that, it would kill our business. Please read this carefully, as it helped the other folks who reported similar issues: Malware will show you popups or redirect you to other sites. Malware sees what you search so it will show popup ads that match what you search and sites you visit. It can also redirect you to other company’s sites. Those companies pay for the leads, of course. Terrible bad karma. We don’t do anything like this. We just make our software and we are nice people. People making money off things like this are often in other countries. The malware gets installed when you click on things that look safe (like coupon offers, etc and free things or offers by email that are too good to be true…or emails that have zip attachments (from someone you don’t know). To repeat: Malware like this: Redirects and Pop-up Ads are absolutely not related to our software. Credit Repair Cloud runs on Linux so it won’t have Windows Malware. Malware is usually aimed at Windows computers. Running malwarebytes on YOUR computer (in safe mode) are what most people try first to get rid of malware. There are also other alternatives, but malwareytes is what we know and use ourselves. Malware can be nasty. It can take over your web browser, your searches and cause damage. It may also prevent you from visiting the malwarebytes website. That’s why logging into safe mode can often help before running it.